I saw Kit Allen's Slide, Already! recommended on Elbows, Knees, Dreams. 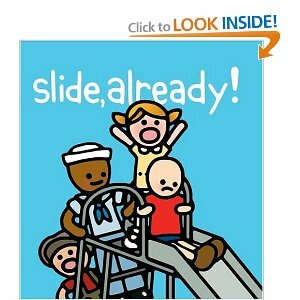 It's about a boy who eventually tries going down the big playground slide, despite all his nervousness, and ends up loving it. It isn't actually a favorite of mine in terms of the illustrations, or the story, really - I'm never quite sure whether it's an example of a kid being encouraged by his friends to venture out of his comfort zone, or an example of a kid who feels like he can't say no to the pressure his friends are putting on him to try something he's not comfortable with - but Basbusa loves it. The plot is simple enough that she can narrate it to herself, and she seems to totally understand the feelings of the little boy as he edges his way higher and higher up the ladder, each time increasing the numbers of "oh no"s in his "Oh no oh no oh no!" She also likes looking at all the different children and pointing out the tallest, the girl with pigtails, and the little boy who always goes down the slide upsidedown. Plus, it's about board-book-sized, which Basbusa always prefers, since it's so much easier for her to handle than a full-sized picture book. 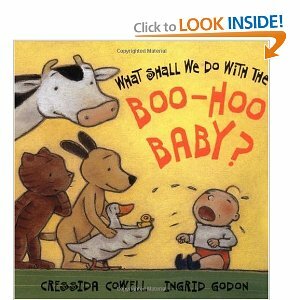 What shall we do with the Boo-Hoo Baby? was another favorite this week. I chose it partly because Basbusa likes babies, and partly because we're likely to have a boo-hoo baby of our own joining the household later this year insha'Allah, so I figured it would do no harm to introduce a few examples of what life with a baby looks like :) The story is simple - baby is crying, and each of the animals in turn has a suggestion for what to do to console him. Basbusa likes being able to predict what each animal is going to suggest, and being able to predict whether it will work or not. She also likes saying "معلش, يا نونو" ("there there, baby") when the tears continue, and she likes looking at all the odd foods the animals bring when they think the baby might be hungry. Another fun read. 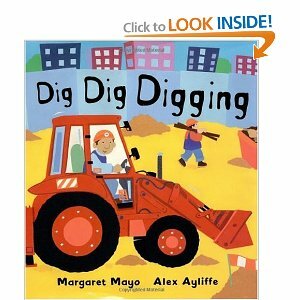 We got Dig Dig Digging out of the library partly because a new pharmacy is being built down the street and there are lots of fascinating big machines for us to watch, but also because it is one of the very few board-books left in our local library that we haven't already read! Actually, though, I'm sorry we didn't choose it sooner, because Basbusa really enjoys it. The illustrations are colorful and detailed, with lots to talk about in addition to the machine featured on each page. We look for people wearing helmets, or look for the animals (birds, a rabbit, a ladybug and a worm) in the field with the tractor, or the different kinds of trash-cans in the page with the garbage truck. Plus it was a good vocabulary-builder for both of us, because I didn't know most of the words for these things in Arabic before we started reading this book! (I'm still not sure of one or two of them, actually - does anybody know if ببور الزلط is really the right word (in Egyptian dialect) for a road-roller?) I thought the text was pretty disappointing, but we just ignored it and talked about the illustrations in Arabic instead. That's what we do with all books in any case, unless they rhyme in English or unless the language is particularly fun. 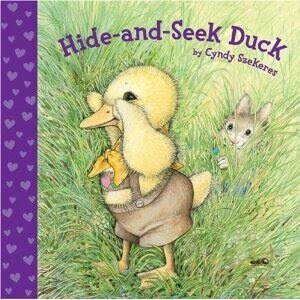 Hide-and-Seek Duck was a used-bookstore find. The story is not too exciting - Duck and Rabbit are playing hide-and-seek, and Duck is looking for Rabbit - but the nature illustrations are lovely. There are all kinds of little details to look for and admire, including lots of insects and plants that we can look for in real life when we go out for walks. Definitely worth the $0.59 we paid for it! 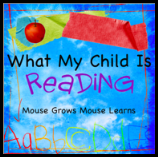 If you'd like to see what books other people have enjoyed with their children this week, please see the link-up at Mouse Grows, Mouse Learns. 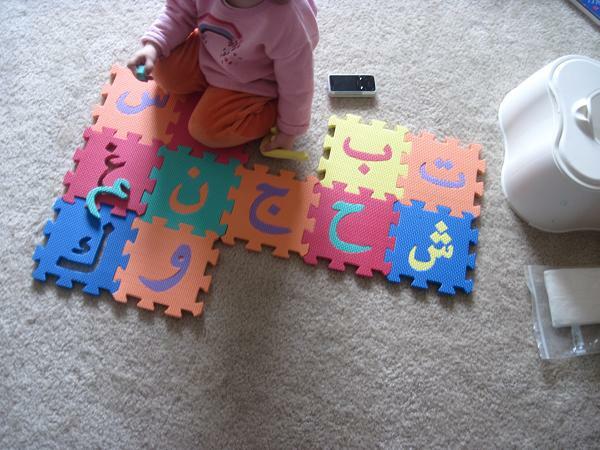 Parents of kids learning the alphabet in English might not appreciate how overjoyed I was to find this toy/puzzle for sale for only $15 at an Islamic bookfair near our house last week! 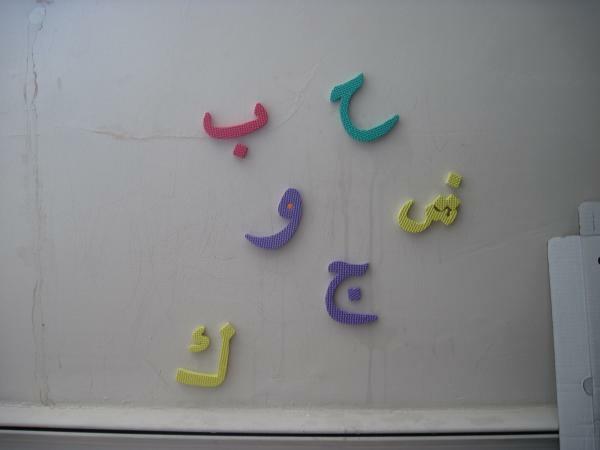 You can pick up similar things in English at any dollar store, but Arabic is a whole other story. I'd seen these online in several places, but the only size that seemed to be in stock anywhere was the large size, with 12"x12" squares, for the insanely ridiculous price of $40. So, I had pretty much given up and stopped looking. But the ones on sale at the bookfair were 6"x6" - a much more manageable size for a toddler in any case - and although $15 is still ridiculous since they probably cost about $0.10 to manufacture, I still snapped one up. And Basbusa loves it! Her new puzzle-doing skills transferred right over to these mats, and she also loves that you can use the squares to build cubes, towers and "houses" as well as just lying them flat on the floor. I pulled out only the eleven letters she already knows, and I'll add to them as she learns new ones (so that she knows which way up they're "supposed" to go and doesn't accidentally confuse herself by getting used to seeing them upside-down or sideways). And another bonus: dip them in water, and they stick to the wall! Basbusa was thrilled, and spent way longer than I expected trying to get all the dots in just the right places beside their letters. Lots of fun! It looks like these things are now back in stock online, too! NoorArt has them here, and they also have a cheaper, smaller version (4"x4" squares) for $9. 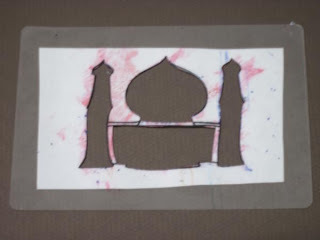 Umm An-Nu'man over at A Muslim Child is Born has a lovely set of three downloadable templates for masjid-based art. So, we tried scribbling in it with markers, outlining it with crayons, and even putting it underneath the paper and doing "rubbings" of it. They all worked in the sense that Basbusa got the general idea, but I think she's still a bit too young for a structured project with a pre-set goal, and I don't want to do anything that might teach her to think that there's a "right" and a "wrong" way to do artwork. So, I put the template aside until she's a bit older. But I guess something sunk in, all the same! 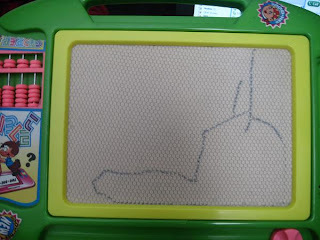 This morning Babusa was scribbling on her magnadoodle while I finished off some work on the computer, and she suddenly said, "Mama! Masjid!" Labels: crafts, Islam, tot school, tot school gone wrong? As I've mentioned in a few previous posts, Basbusa has so far shown no interest in puzzles of any kind. Jigsaws, simple wooden ones with big knobs, greeting cards cut into two - all complete flops. Until... hooray for the Dollar Tree ... the arrival of this puzzle in her toy collection! She's not obsessed with it, but she does (a) get the concept (finally!! ); (b) enjoy it; and (c) is able to do it! Woo-hoo! 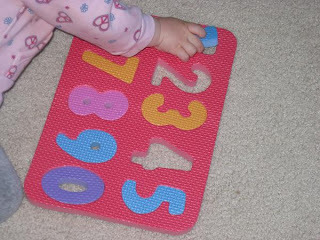 Plus, it's been very helpful for increasing the number of numerals she can recognize. And the six-versus-nine issue, which has long been a point of confusion, has been greatly helped by being able to compare the two numbers, one in each hand, while we discuss how six has the circle at the bottom and nine has the circle at the top. With the weather finally becoming more Spring-like, I've been trying to make sure we get outside every day we possibly can. Running and exploring is fun, of course, and also helps a lot with earlier bedtimes! But I also want to try to encourage a love of nature and an appreciation of its wonders. Good for science later on, good for the environment, and will also tie in well with all the nature-appreciation in the Quran, insha'Allah. One thing that we've found helpful is the little nature-treasure-baggie, above. 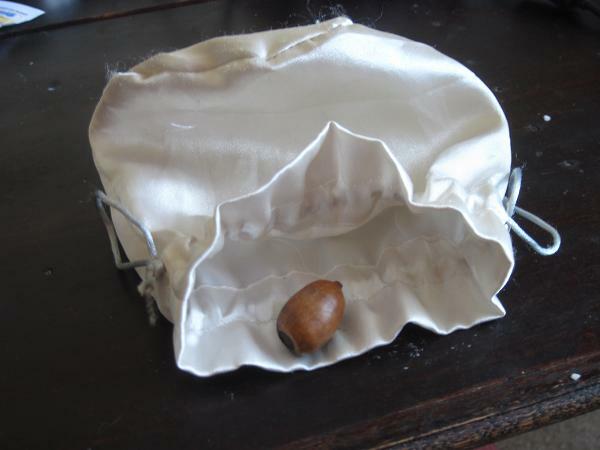 We take it with it on most walks, and when Basbusa finds something she really loves - stones, flowers and acorns are her favorites - she puts it into her baggie. She likes the treasure-hunting aspect of it, and it also gives us a chance to talk about the objects again when we get home. 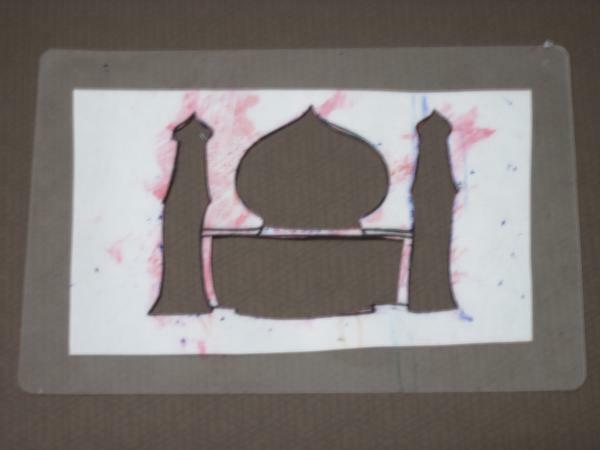 Muslim tot-school: al7amdulillah for mini prayer-rugs! 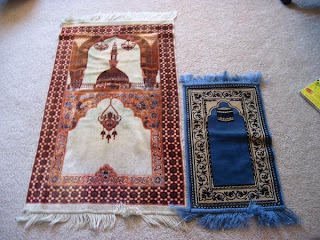 A wise and insightful friend, having read my last Muslim Tot-School post, said that she had found that her daughter suddenly started loving to pray alongside Mama after they bought her her very own mini prayer-rug. Well, a solution that simple has to be worth a try! So we bought Basbusa a little prayer-rug of her own ($5 at a local halal butcher-and-random-Islamic-stuff store)... and al7amdulillah! She loves it! At least once a day, and usually more than once, she goes and gets her rug and puts it beside mine while I'm praying (spending forever to get it spread outjust so, but hey, I'm not complaining!). Her "praying" consists of an opening takbeer and then lying face-down on her rug, tapping her index finger, but she hangs out there for at least a ruk3a or two. She also loves the salaams to each side at the end. I'm sooooooooo happy - it makes me feel so incredibly lucky to see my tiny munchkin there beside me while I pray! Two other things have also been going well for us lately, al7amdulillah. If Basbusa doesn't feel like joining in at prayer-time, I never push the issue, but I do ask her to do a quick takbeer instead, and she now does so quite happily. What I'm hoping is that she'll get the idea that although drawing/jumping on Baba/pushing her doll in a stroller are very fun things to do, it's normal to expect to put them aside for just a moment when we hear the athan. So far, so good on that one. One thing that I've been - well, not *worried* about, but very aware of - for a while now is that Basbusa just doesn't see much Arabic writing in the world around her. We only have four books in Arabic (we have a few more stored away for later, but they're not really toddler-oriented), and a flimsy Egyptian kindergarten alphabet book. Basbusa sees Arabic when we're memorizing Quran together, but that's about it. All those easy activities you can incorporate into daily life if you're teaching your child the English alphabet are just not available while we're living in the US: there are no Arabic street-signs, store names, advertisements on buses, labels on grocery shelves, etc. And particularly since Arabic script looks so different from the stand-alone Arabic letters which we've been learning, it seems all the more important that Basbusa would just have some general exposure to what writing "looks like." I change the words on it every so often, although "Allah" is usually up on top. 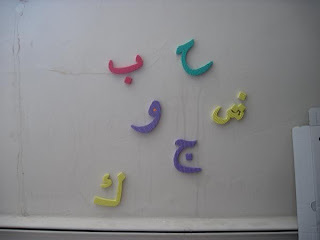 (For non-Arabic-speakers, it currently says "Allah," "Mama" and "Baba," as well as Basbusa's real name, whited-out for the purposes of the blog :) My goal with this is definitely not to try to push her into reading! I'm in no rush at all about that. She's usually watching while I change the words, and I tell her what each one says, but that's it. We don't dwell on them or study them or really pay them any attention at all - they're just part of the environment. I'd just like her to have the opportunity to become aware that there's something called "writing" and that this, more or less, is what it tends to look like. It's an awareness that I'm sure she'd gain without any effort at all if we were working in English, just from seeing words all around her. So imagine my surprise (and delight! and huge fountains of maternal pride and goofiness! and calls to the grandparents!) when it turned out that Basbusa had actually picked up on every single word I've ever written up there? The other day, she brought me her magnadoodle and said, "write something! write something!" She uses "write" for both writing and drawing, and what she almost always wants is a picture of a cat, but this time, just for the heck of it, I wrote her name. "Basbusa! ", she cried, pointing to herself. What?!? Really?!? So I went through all the other words that have been up there, and she called out "Allah! Baba! Mama! Basbusa!" (couldn't resist throwing her name in again! ), and even her best friend's nickname, "Raspberry! ", which was only up there once, ages ago, for only a few days. She wasn't even stopping to think about them. Of course she's not really reading; she has just memorized what those particular words look like, but you can just imagine how proud of her I was! Another hit-and-miss tot-school session today, as usual! Labels: tot school, tot school gone wrong? Please note: I link to TotSchool once a week, but I actually post our activities one day at a time rather than in a weekly wrap-up. You can see all our Tot School posts by clicking on the "Tot School" link on the right. Apologies for the long silence! Work always gets crazy at the end of the quarter, so blog-updates fell by the wayside for a while there. Lots of pictures of food, which Basbusa always likes to talk about! And numbers of all kinds sprinkled around the page. In the example above, which is the first time we tried it, she was finding the "3"s and I was circling them, and then she found the "9"s and I put a rectangle around them etc, but she wasn't too enthralled, and needed a lot of encouragement and prompting. Since then, however, we've evolved a bit: Now she gets to hold the pen, and we put "stars" (in other words, enthusiastic scribbles) on whichever number we're looking for . We also mix it up a bit by putting stars on the strawberries, or on the noses of the models in clothes-store ads, or on the letter "S"s (the only one she knows so far in English), and she's much more interested. We've had fun with this quite a few times. Next up: using a teaspoon to put pom-poms into a little tray which used to line a box of chocolates. Why? Well, I'm not quite sure. The entire tot-school universe and its mother seems to do this kind of thing, whether it's using tweezers to put erasers into egg-cups or using tongs to put marbles onto upside-down bath-sucker-thingies, so I'm sure there must be a good reason behind it. One-to-one correspondence, maybe? Fine motor skills and finger-strength? Their kids also seem to love it, so I thought we'd give it a try, but it didn't really work out. First of all, Basbusa, lover of all things pink, picked out all the pink pom-poms and spent quite a while trying to cram them all into her pocket. She was momentarily intrigued when I started putting one pom-pom into each spot on the tray, but clearly thought it was silly to be using a spoon when fingers were so much easier, and soon lost interest anyway. I held her attention for a few seconds longer by engaging her love of giving orders and letting her dictate which spot I'd put each pom-pom - I figured that if the point is one-to-one correspondence, she'd still be getting some use out of it this way - but we were done pretty quickly. Ah well. Whatever the point was, I don't think we got it! To see what everyone else and their tots have been up to this week, please check out Tot School headquarters over at 1+1+1=1.